A decision on the Rs 3,500-crore VVIP helicopter deal is expected within next few days. 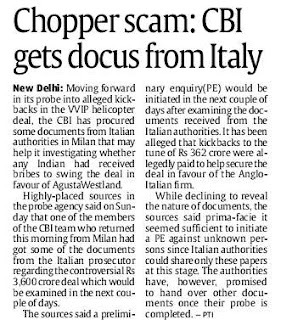 While a CBI team has procured documents from the Italian authorities, the Ministry of the Defence will start the process of dealing with the show-cause notice it had sent to Italian aerospace major Finmeccanica tomorrow. 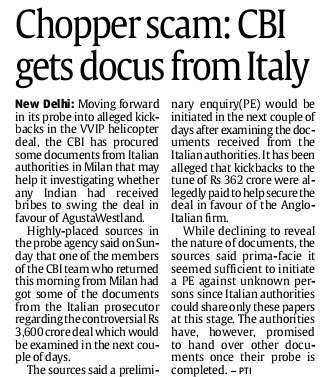 There have been allegations of a pay-off of Rs 350 crore in securing the deal for AgustaWestland, a helicopter producing subsidiary of the Finmeccanica. 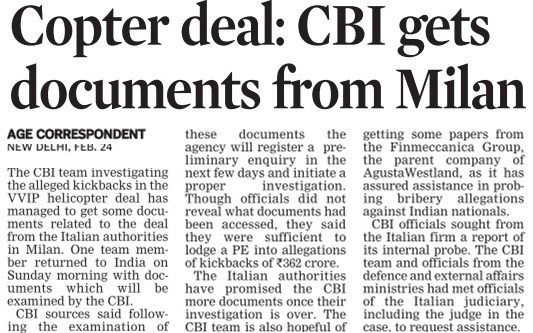 The CBI team returned this morning from Milan with a set of documents procured from the Italian prosecutor. The documents would be examined over the next couple of days and then the CBI will register a preliminary enquiry (PE). 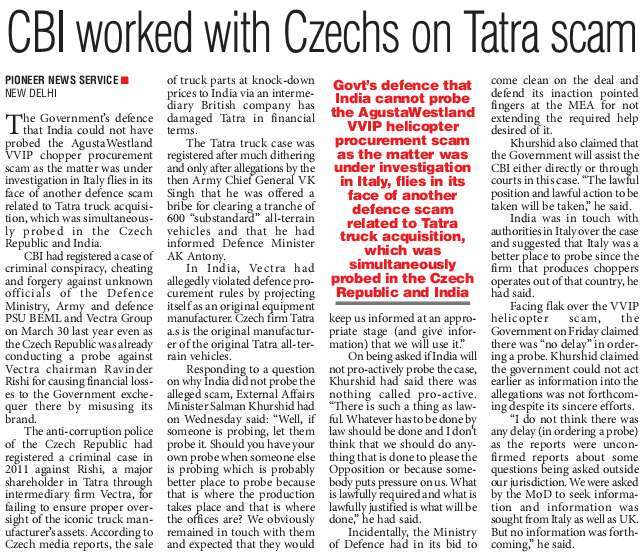 “Sufficient evidence was on record to register a PE and that would be enough for the CBI to suggest to the MoD, the further course of action,” sources said. The case will be against “unidentified persons” since the Italian authorities have so far shared only certain papers at this stage. 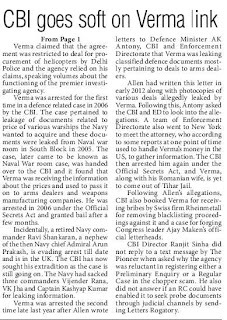 The registration of a case will allow the CBI to seek help of Interpol, which had earlier expressed inability to provide any help in the absence of any regular case by the agency. One member of the CBI team is still in Milan and was expected to get more papers from there. 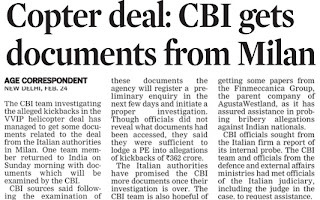 CBI officials had requested the Italian firm to hand over the report of its internal probe. 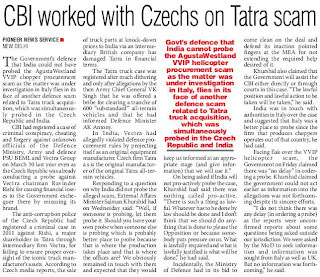 The CBI team, along with officials from the MoD and the External Affairs Ministry, also took help of senior officials of the Italian judiciary to request for assistance in probing the role of Indians in connection with alleged kickbacks in the deal. Two law firms-Chiomenti and Grippo-helped in coordinating with the Italian authorities. A maze of middlemen and corrupt officials aiding helicopter-maker AgustaWestland had worked through a system that did not allow any “scent of money trial” to reach Indian investigative agencies. The MoD was left looking only at procedures and the laid-down specifications for the helicopters. Its functionaries could not see any possibility of money being exchanged. The alleged kickbacks controversy in the Rs 3,546-crore deal for 12 VVIP AW-101 helicopters has started casting a shadow over another mega $1.2 billion contract for 16 multi-role choppers for the Navy's sea and off-shore operations. In both the deals, AgustaWestland, a British helicopter manufacturing subsidiary of two different European consortiums, is in the eye of the storm. Its rival in both the lucrative deals is the American firm Sikorsky, which is known for making Blackhawk and Seahawk gun ships. For the VVIP helicopter deal, Sikorsky had offered its S-92 Superhawk. And for the naval deal (TM (M) /0025/ MRH/ 9918), the American firm has pitted its Seahawk (S-70B) against AgustaWestland's NH-90 machine. 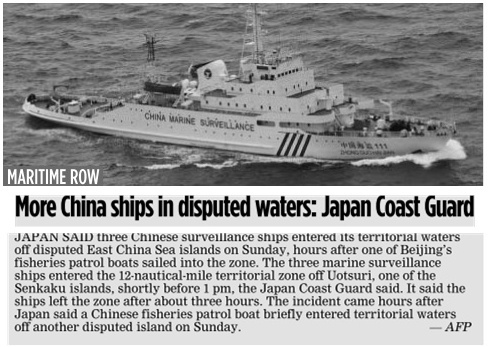 A final decision in the naval deal is being awaited for long. Technical trials ended in 2011. In the global market, undue delay has led to the impression that this deal has drifted into rough weather. The delay in procuring the naval helicopters is impacting the operational readiness of the Navy with some frontline ships are without their air assets and hence their inability to realise the full operational potential of the fleet at sea. 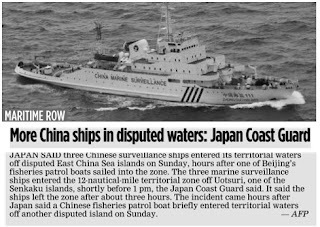 The delay leads to cost overruns, technological obsolescence and leaves a vital maritime security gap. As the Defence Ministry has made a move to scrap the VVIP helicopter contract and may 'blacklist' AgustaWestland for at least 10 years, the question that is being asked in South Block is whether it would lead to its 'exit' from the naval helicopters deal too. If current circumstances lead to AgustaWestland's forced 'exit' from the naval deal, would the government grant the contract to Sikorsky, the only rival in the race, or the government would go for a fresh tender, the industry watchers wonder. Defence experts feel that even if AgustaWestland is blacklisted, the government must open the naval deal's commercial bids. "Otherwise, the government would be accused of deliberately allowing the Americans to pick up the contract unopposed, especially in view of AgustaWestland's several 'letter missiles' to the Defence Minister AK Antony and the Defence Secretary SK Sharma last year, alleging that the US firm was "granted waivers on a number of non-compliances with qualitative requirements." 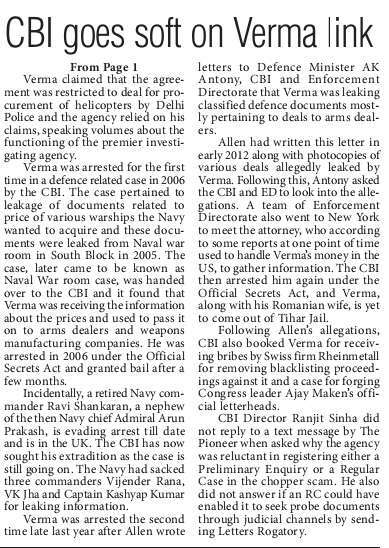 The Tribune had procured all these letters and reported this issue in an exclusive report on July 9, 2012. When contacted for comments on the VVIP and naval helicopters deals, Sikorsky refused to say anything on the plea that it is against their code of ethics and that they believe in buyer country's technical evaluation and procurement process. The VVIP flying machines scandal has already claimed its first casualty. The Defence Ministry has deferred a decision on the joint Army-Indian Air Force procurement of 197 Advance Light Helicopters for search and rescue operations, a deal worth over Rs. 3,000 crore. Interestingly, in the Army-IAF contract, AgustaWestland withdrew in 2010, alleging that the deal was being processed in favour of the French-German combine Eurocopter. The naval helicopters deal began rolling eight years ago. The tender was 're-issued' over three years ago. 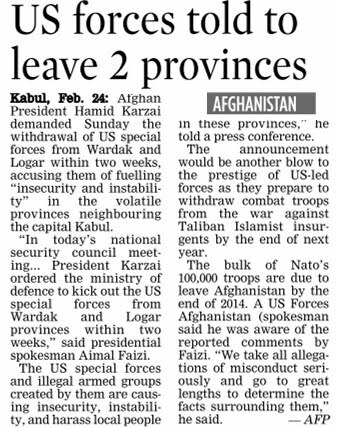 The deal has been hanging fire despite the conclusion of the technical trials in 2011. The opening of the commercial bids, for strange reasons, has been extended thrice. Now, it stands extended till March 31, 2013. AgustaWestland is the British subsidiary of Italian conglomerate Finmeccanica which clinched the VVIP chopper deal. The Italian Treasury holds 30.2% of Finmeccanica's share capital. AgustaWestland is also part of another European consortium, the NATO Helicopters Industries (NHI), which is pitted against Sikorsky in the naval deal. The NHI is a French company, wholly owned by Eurocopter, AgustaWestland and Fokker Aerostructures and provides the focal point for these companies for the naval NH90 programme. In the NHI, the firms of Italy, German, Spain, Finland and Australia also have stakes. 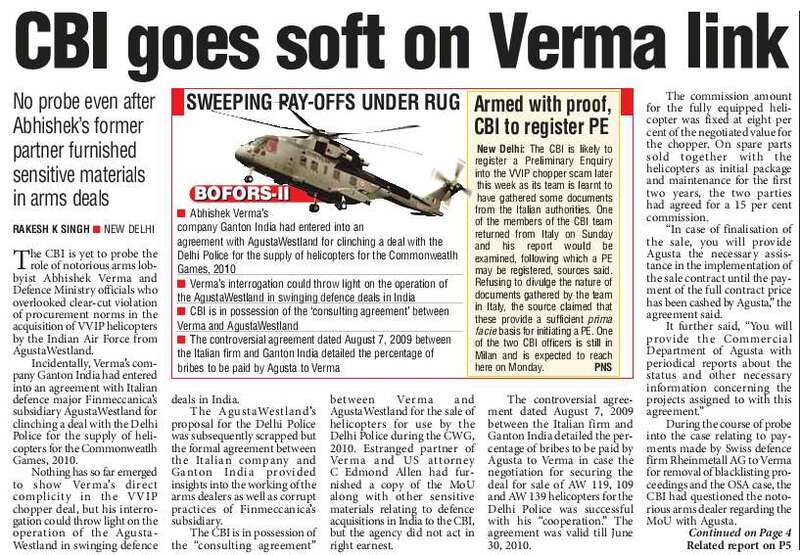 After the exposure of the kickbacks scam in the VVIP helicopters deal, questions are now being asked whether an extraordinary delay in opening of the commercial bids in the naval choppers contract is "deliberate" to bail out AgustaWestland. Industry sources see it as a deliberate ploy to derail the whole project, and get the tender re-issued. 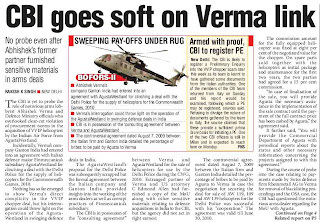 A senior defence ministry official said, "Who knows that it was an attempt to get the tender re-issued with requirements tweaked to elbow out the unwanted as was done in the VVIP helicopters deal!" The Ex-servicemen Contributory Health Scheme (ECHS) membership will now be linked with the government’s Aadhaar scheme that aims at providing a unique identification number (UID) to all Indian citizens. A letter received by the Air Force Association from the ECHS authorities states that the Aadhaar scheme’s UID has to be quoted in applications for all new cards issued from April. Existing ECHS members are required to submit a photocopy of their UID and ECHS cards to their parent polyclinics, which would then forward the same to their respective regional centres. This exercise is expected to be completed by September 2013. The details will then be added and integrated into the data base of all ECHS members. The ECHS has a clientèle of over 42 lakh ex-servicemen and their dependants. Aadhaar is a 12-digit individual identification number issued by the Unique Identification Authority of India, which will remain valid for life and serve as a proof of identity and address anywhere in India. It is designed to eliminate the large number of duplicate and fake identities in various government and private databases and help provide access to various government and non-government schemes and services like banking, phone connections and welfare measures. Many veterans have questioned the need to link the ECHS with the UID, especially in the light of the slow pace of issuing Aadhaar cards and veterans already having verified their identities and other details and possessing several proof of identity documents. Till the beginning of this month, only about 28 crore Aadhaar cards covering less than 23 per cent of the national population have been issued. Moreover, many government establishments and public dealing offices do not accept Aadhaar cards as proof of residence. Veterans are of the view that making another document mandatory will only add on to the procedural burden and clientele’s woes when the ECHS is already grappling with more serious administrative and operational issues. While the necessity of a secure, national bio-metric based proof of identity cannot be underscored given the security scenario, the Parliamentary Standing Committee on Finance has observed that the scheme is riddled with serious lacunae and concerns. The UID scheme has been conceptualised with no clarity of purpose, it said. 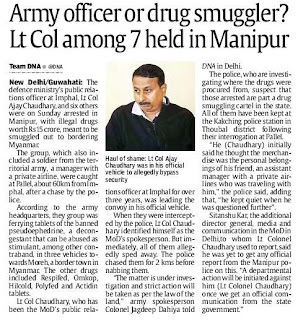 A Lt Colonel and five others were detained by the Manipur police for alleged possession of prescription drugs that were meant to be smuggled into neighbouring Mynamar for producing 'party drugs'. In Manipur, the police has said tablets are worth Rs 1.50 crore and these were found inside three vehicles at Pallel, in Chandel district of the state. Once in Myanmar, these are converted into well known party drugs and the price goes up by 15-20 times. Those detained included Army PRO Lt Col Ajay Chaudhary and his assistant, the police said. Army spokesperson Col Jagdeep Dahiya said in Delhi: "It is a matter of investigation. If found guilty, strictest action will be taken as per the law of the land," The drugs included tablets of Respifed, Omkop, Hilcold, Polyfed and Actidin. 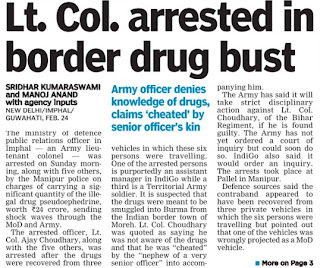 Imphal: A Colonel-rank Defence PRO and five others were on Sunday arrested by Manipur police after they were caught allegedly carrying illicit drugs valued at an estimated Rs 15 crore meant to be smuggled out to Myanmar, in one of the biggest such hauls in the state. The contraband was found in three vehicles at Pallel in Chandel district, state police said here, adding they had taken into custody Defence PRO Colonel Ajay Chaudhary, his assistant RK Babalu, IndiGo assistant manager Brojendro Singh, Haopu Haokip, Minthang Bongel and Milan Haokip. The six were interrogated at Pallel police station, about 45 kms south-east of here, police said. A case has been registered against them under various sections of the Narcotic Drugs and Psychotropic Substances (NDPS) Act. They will taken to Kakshing police station in Thoubal district, they said. 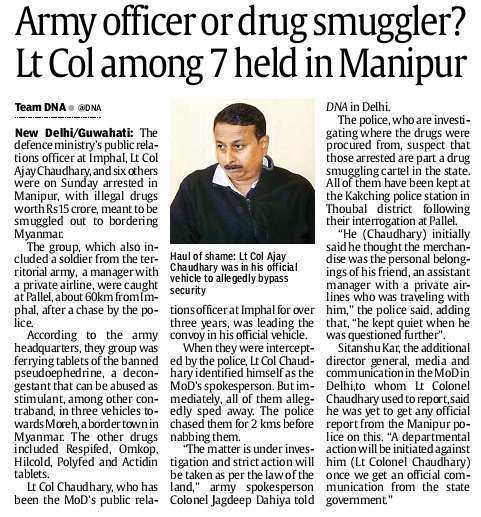 "Colonel Ajay Chaudhary has been arrested this morning by the Manipur police along with five other persons. We have been made to believe that certain contrabands have been recovered," Army Spokesperson Colonel Jagdeep Dahiya said in Delhi. The Army promised strict disciplinary action if any personnel were found involved in the case and a Defence Ministry spokesman said in Delhi that once a formal report into the incident comes to the department, appropriate action will be taken against the officer. 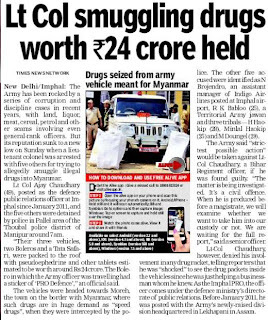 Claiming that he was not aware that the consignment contained illicit drugs, Ajay Chaudhary said he was "cheated" by "nephew of a very senior officer" into accompanying him. He, however, did not identify whom he was referring to among those arrested. "Yesterday, the nephew of a very senior officer whom I know had come to me. I have met him two or three times at his place. He said he had come to trade in Moray and a few people harassed him enroute to Moray," he said. "I asked him what it was, he said nothing just a few things that I deal with. There will be a few packages I would be taking in my car. So you don't have to worry. So I said OK...," Chaudhary said, adding he had also asked his friend from IndiGo who agreed to join him so that they could do some "shopping" in Moray. 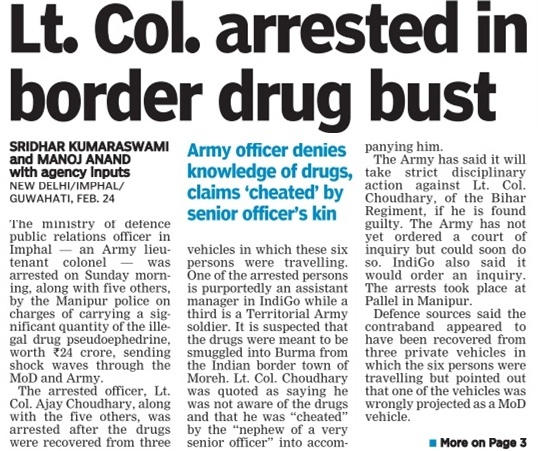 The officer said he had allowed the commandoes at a check point to inspect the vehicles as he had suspected nothing wrong. "Since, he is a friend and he is a relative of someone senior, you will never suspect him of doing anything like this.... Somehow I have been cheated in this," he said. Army spokesman Dahiya said, "We would like to state this much that if he is found guilty as per the law of the land, strict disciplinary action will be taken against him", adding, "we will get involved in the process when we are formally approached". 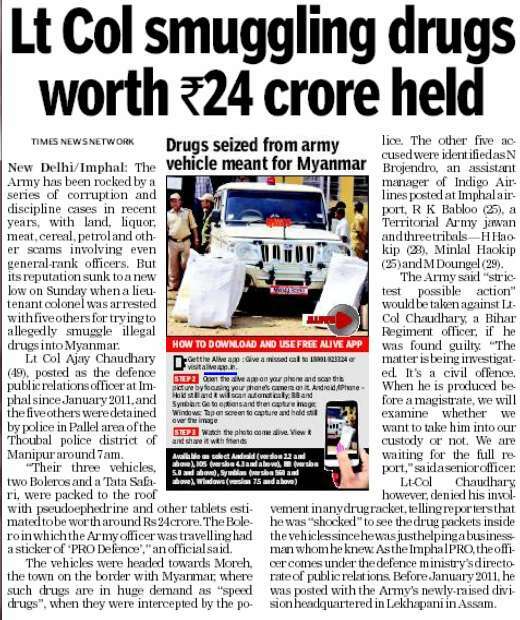 The drugs included pseudoephedrine tablets Respifed, Omkop, Hilcold, Polyfed and Actidin and were worth Rs 15 crore, they said, adding it was one of the biggest drug hauls in the state. Also called party drugs, they are prone to abuse as they cause intoxication. AMMU: The Chief of Army Staff General Bikram Singh visited the Northern Command in Udhampur district of Jammu and Kashmir on Saturday. Singh spoke to Lt Gen KT Parnaik, GOC-in-C Northern Command and other senior officials who appraised him about operational preparedness as well as the dynamics of the proxy war situation in the State. A defence spokesperson said due weather conditions Sungh had to land in Jammu and go to North Command by road. He added that Singh exhorted senior commanders to further consolidate on the gains in counter insurgency operations during the past two years.